All new members of the Corps will participate in FROG Week, an experience that you will remember for the rest of your life! To complete the transition from civilian student to military Cadet, you must rely on each other and work as a team. Upon your arrival, you will begin in-processing into the Corps of Cadets. Your company will already be assigned to you and the cadre (upperclassmen Cadets) will direct you to your Cadet residence hall. You will unload your luggage and be placed into a small group to continue in-processing. Then you will run to the records administration location and ensure that all of your required paperwork has been filed properly. You will then be taken to one of the local barbers for a hair cut. After the hair cut, you will be taken to the campus bookstore to pick up your uniforms. You will then return to your respective Cadet residence hall and meet the cadre of your company. Be sure to stand tall and look good. After you in process with your assigned company, you will move all of your personal items and uniforms into your new Cadet residence hall. Shortly thereafter, you and all of the other new Cadets will be called to formation. This will be the first of many company formations. Your cadre will then march you to the chow hall for dinner. Before the night is through, you will have a meeting with the president of the college, our Commandant of Cadets, Professor of Military Science, and other officials. After the president’s welcome, there will be a short run back to the Cadet residence halls where you will be given time to set up your room and get cleaned up before heading to bed. Lights Out! Wake up, now it is time for the fun to begin. It’s time for PT. Once you finish that you will get cleaned up and head to chow. After breakfast you will draw a weapon from the armory and begin learning drill and ceremony. The majority of the day is dedicated to small unit level training in which your squad leader will teach you a multitude of tasks such as drill and ceremony,weapons cleaning, and military customs and courtesies. These classes are crucial to your development and success as a Cadet. After the day of classes everyone will head to the chow hall for dinner. After chow, you will participate in the Retreat Ceremony; the tradition of lowering the United States flag. Retreat is one of the most important traditions that the Army has. Once the ceremony is over you will be taken around our campus to learn many of the college’s traditions. Then it’s off to the Cadet residence halls for personal hygiene and bed. Day Four will be a long, hard, trying day that will test your endurance. The day begins with company PT before the sun even rises. In fact, it might still be dark when you head back to the Cadet residence halls for personal hygiene. After you get cleaned up and eat, you will take a little trip to North Georgia's training facility at Pine Valley. 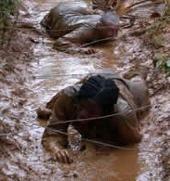 Remember one thing: encourage your cadre to get dirty today. At Pine Valley you will negotiate the grenade assault course, the leadership reaction course, and the low-ropes confidence course. You will also see a demonstration from one of North Georgia's elite specialty units who will then teach you basic military skills such as individual movement techniques (IMT) and camouflage. Another elite specialty unit, the Mountain Order of Colombo, will be present to teach you military survival techniques. This is a great day to see what you are made of! Early in the evening you will travel back to the college. You will eat chow, then clean up and hit the rack. If you are not tired by the end of today, don’t worry... there is always tomorrow. Day Five puts the end of FROG Week in sight, but there is still a lot of tough training to be accomplished. By this point, you are beginning to understand what it means to be a Cadet. You are starting to become part of the history and traditions that make North Georgia unique. On Day Five you will go to Camp Frank D. Merrill which is home to the 5th Ranger Training Battalion and the Mountain Phase of the US Army Ranger School. You will train where the elite train. Your company will conduct a foot march to the training site where you will see a demonstration from the Mountain Order of Colombo. After the demonstration, you will receive classes on military mountaineering techniques and knot tying. You will then tie your own Swiss-seat harness, and rappel down a thirty-foot tower. Once you successfully negotiate the thirty-foot tower, you will put yourself to the test and rappel down a sixty-foot rock face. Later in the day Ranger Challenge, another specialty unit, will teach you how to use a one-rope bridge and three-rope bridge to cross a river. At the end of the training activities at Camp Merrill, you will go on a six mile foot march. Just remember only one day left. You then will travel back to campus where you will eat chow. This night is reserved for the presentation of the company Guidon. It will be given to the most outstanding individual in the FROG class for that company, good luck! Last day of FROG week, just get through today and you are done. You will get up and dress in your PT uniform and head out for a light breakfast. Once you are done with chow your company will head to the drill field so that the Crown Mountain Run can begin. The run is over three miles... up a mountain. The Crown Mountain Run is the culminating event for FROG Week. You can do it; you have made it this far so do not quit. After the run there will be a ceremony accepting you into the Corps of Cadets. The Guidon bearer will also be recognized at this time. Following the ceremony you will be released to get cleaned up, put on a fresh set of ACU's, and partake in our traditional luncheon of frog legs. When you are finished chow, you are able to spend a few hours with family and or friends. You will be told when you are to report back to the company. Congratulations on making it through the week.